16 X 100 Kronor 1961. 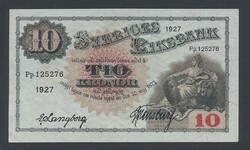 Alle mit verschiedenen...more 16 X 100 Kronor 1961. Alle mit verschiedenen Serienbuchstaben. 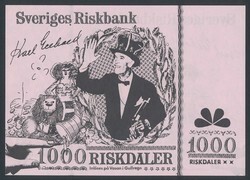 Sweden, Banknotes, 5-500 kronor, nominal value 10000 kronor,...more Sweden, Banknotes, 5-500 kronor, nominal value 10000 kronor, mixed quality. 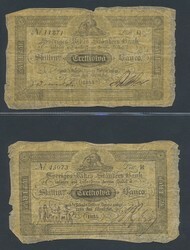 Sweden, SF 2:8 32 Skillingar Banco 1855 So called "Canary Bird". 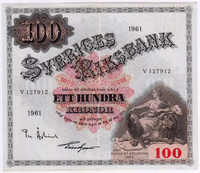 No....more Sweden, SF 2:8 32 Skillingar Banco 1855 So called "Canary Bird". No. 11871 Litt. Q and No. 45073 Litt. R. Two pieces. 1-1?